Conch – Hello Korea ! IMG_0245, originally uploaded by Almost-Human. 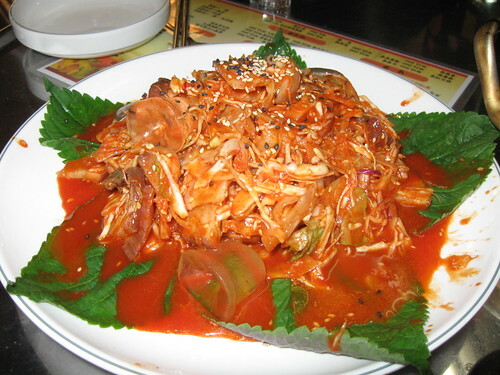 This is often served as a side dish if you go out and drink soju. It is served cold (see the ice cubes?) as a salad, and is very yummy. The language exchange guy told me the waiter made it special for me without asking, and that I should thank him. (People are always telling me when I should thank someone else – trying not to be offended by this being infantalized thing) I wondered why, and he said that he made the dish less spicey. But I LIKE SPICEY! I moaned. The amount and variety of assumptions made about foreigners, and especially ethnic Korean foreigners boggles my mind.